What is a Makerspace? A Makerspace is a physical location where people gather to share resources and knowledge, work on projects, network, and build. Makerspaces provide technology, tools, and space in a community environment. Learn how to work with technology and make new creations through hands-on exploration. 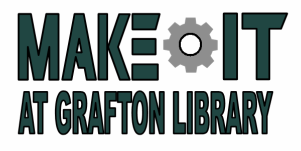 The Grafton Public Library's Makerspace offers a variety of new and old technologies for patrons to experience hands-on learning. Come work on projects, create, collaborate, and build. The Makerspace Room and Makerspace On-the-Go Cart are available during library hours to anyone who has a valid Eastern Shores Library Card. The Makerspace Room provides state-of-the-art technology for community members to explore. Learn how to publish a book, make a podcast, create digital art, preserve your family history, and much more. The Makerspace-on-the-go provides materials for learning about basic circuits, electronics, and more. Learn how to make a basic circuit that lights up an LED. Explore with Littlebits. Learn about microcomputers and microcontrollers such as Arduino and Raspberry Pi.